By Wilkinson Sword. 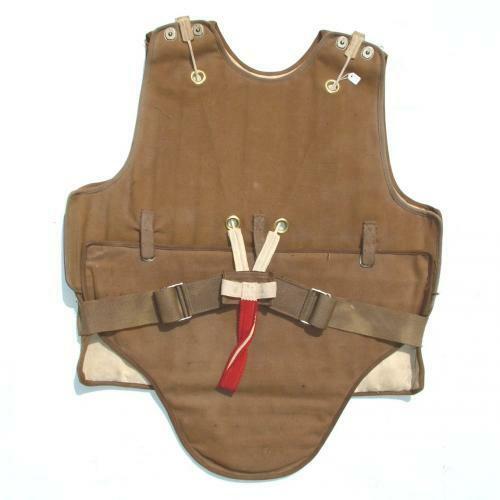 British made flyer's body armour, Type A with Type C apron. Devised by the 8th AAF Surgeon Col. Malcolm Grow in conjuction with Wilkinson Sword, the anti-flak vest is comprised of three parts, front, rear and abdomen/groin. Each section is constructed using overlapping manganese steel squares sewn into pockets within an heavy brown canvas covering. This was backed with a soft brushed cotton for comfort. It was equipped with a quick-release system using cords and lift-the-dot fasteners that allowed the entire suit to fall away from the airman in case of emergency. Intended for use by gunners, navigators, bombardiers and radio operators, whose duties involved standing or moving around the aircraft. Flak suits were issued from a 'pool' prior to missions and returned at the end of the 'Op' for use by outgoing crews. They were developed as a direct result of injuries sustained by 8th AAF crews flying from England. Initially there was considerable resistance and objection to wearing them but it is estimated that they reduced flak and bullet fatalities by 50% & injuries by 70%. These early development suits were manufactured by Wilkinson Sword in the UK but production was slow and later models were manufactured in America. This example has British A.I.D marks and the War Dept. broad arrow. The RAF used flak suits in limited numbers and it is possible that this is one of those. Condition is generally very good to excellent. There is no damage and the suit retains good colour and is quite clean. A superb display piece removed from our own collection. Extremely heavy and may, in some circumstances require postal costs over and above those quoted by the 'online calculator'. Stock code M9907.